Sorry, Baby, You Don’t Exist! You are at:Home»Life Issues & Bioethics»Contraception & Abortion»Sorry, Baby, You Don’t Exist! Two news reports this week give us pause to ask the same simple question: When a woman is pregnant, does she and/or her family have a moral obligation to care? The sense one receives from reading these reports is that the answer is no, never. The Munoz family wants Marlise disconnected from life support. However, the doctors cannot accommodate the request because their daily tests find that the baby is growing and has a normal heartbeat. CORRECTION: The hospital is not attempting to treat a dead person; it is treating a baby who is very much alive and happens to be living in his mother’s womb. In other words, while the debate continues regarding whether or not brain death should even be a legal definition of death, the fact that the baby is growing and very much alive means nothing to those advocating for abortion-on-demand. In fact, it seems to mean nothing to those closest to the baby—his father and maternal grandparents. In reality, Roe v. Wade allows babies to be aborted through all nine months in all 50 states right now! Be that as it may, not only is this a question of human rights for all human beings, but it is a question of common sense. The second story this week makes my point. In a recent medical journal article addressing the relationship of ultrasound to planned abortion, the result is a shocker: “Patients opted to view the ultrasound image 42.5 percent of the time. Nearly all pregnancies (98.8 percent) were terminated: 98.4 percent of pregnancies among women who viewed their ultrasound images and 99.0 percent of pregnancies among the patients who did not. Among women with high decision certainty, viewing was not associated with deciding to continue the pregnancy.” In other words, even though the expectant mother can see her baby and witness the awesome reality of this child growing within her, she remains unmoved. Chilling! 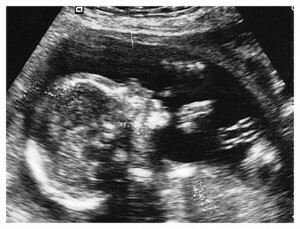 You see, if even the expectant mother who sees her baby on an ultrasound screen remains unmoved and pursues the abortion, is it really shocking that the family of an expectant mother deemed “brain dead” would not want to wait until this baby, fruit of his mother’s womb, was capable of being born alive? This preborn child is not viewed as a member of the family in either case. This baby is not seen as the gift this tragically ill mother is giving to her family as her legacy. Rather, the child is viewed as a problem standing between healthy family members and their wish to end their own grief over the possible actual death of this lovely woman who is with child. Babies not yet born do not have rights. Too many members of our society are quite comfortable with the idea that there really is no human being in existence prior to birth unless the mother explicitly endows her baby with the right to life. If that isn’t twisted and perverse, then what is it? Sorry Baby, you don’t exist.